Firewatch is the first game from both developer/co-publisher Campo Santo and co-publisher Panic Inc. People from the development team have worked on a myriad of games, including quite a few Telltale veterans. 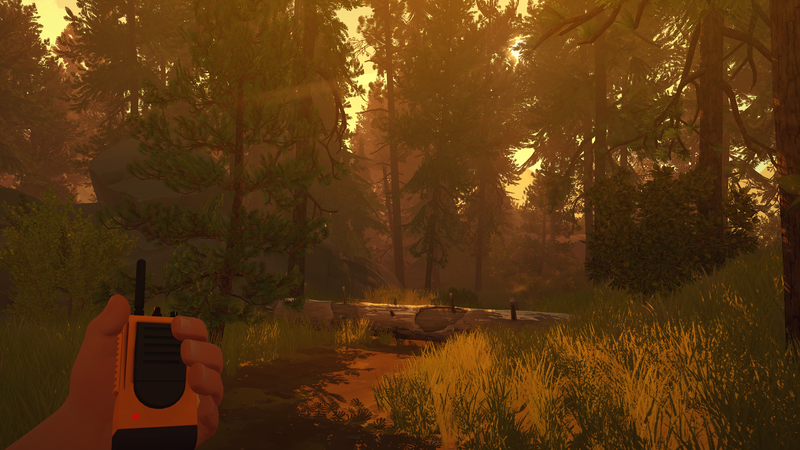 I went into Firewatch knowing very little about it besides the Telltale connection and that it was looking gorgeous. I honestly don’t want to say a thing beyond what I’ve quoted from the Steam page. 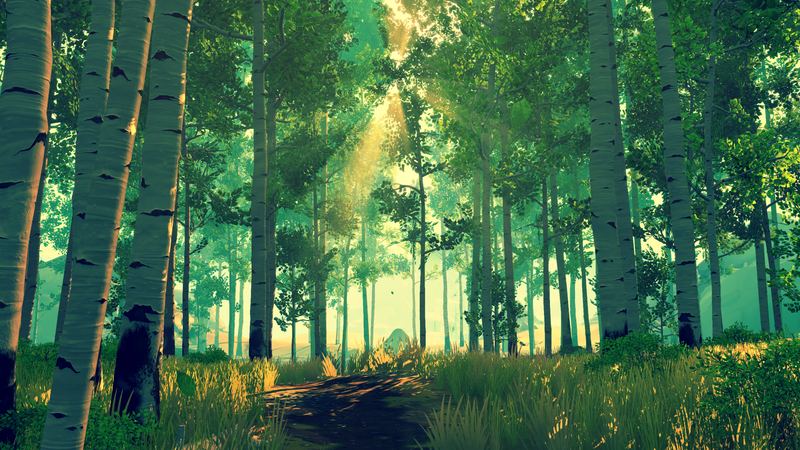 I don’t want to ruin the experience of uncovering what Firewatch has for you. I will say this: I was utterly absorbed, and I really loved this journey. Henry and Delilah are both people who I ended up liking a lot and becoming attached to. It feels real, and it elicited intense emotions for me. I admire the writing a lot, and it’s also quite funny. I played on my PC on ultra mode and the game is stunning. It was created in Unity with some additional plug-ins and other work from the team. I was continually impressed with what I was seeing – the area of Wyoming where Henry and Delilah are stationed is pretty varied in its beauty, from lush forests to rocky canyons. There’s mist coming off the water, leaves falling from the trees, butterflies flitting by. The crepuscular rays were what impressed me the most, and a lot of my screenshots are of sunlight filtering through clouds and trees. I do a fair bit of hiking with my friends in real life, and this was so wonderful in that it triggered a lot of good feelings and associations with being out in the woods. The skies will change as the day goes by, but these changes are scripted – you can spend as much time as you like in one spot, but when you press on through the plot, the sun will start to move. In terms of your own animation, you can see not only Henry’s hands, but his entire torso and legs, which is really cool (and pretty rare for a first-person game). Cissy Jones (The Walking Dead Telltale series, Moebius: Empire Rising, Gabriel Knight: Sins of the Fathers 20th Anniversary Edition, Life Is Strange, Fallout 4, and Lego Marvel’s Avengers) and Rich Sommer (Mad Men, Wet Hot American Summer: First Day of Camp) provide the voices for Delilah and Henry, respectively, and their performances are excellent. Chris Remo’s soundtrack is gorgeous, and I’m going to buy it as soon as I’m able to. Sometimes I was unsure why exactly the music cued when it did, but it was always welcome. There isn’t a continual soundtrack, and most of the time you’ll be listening to birds chirping, wind rustling the leaves, and running creeks. Delilah will send you out into the wilderness as you play, contacting you on your trusty walkie-talkie. You have a limited time to make your dialogue choice during these conversations, much like a Telltale game. What you say – or don’t say – will affect your relationship. I may have mentioned in the past that I love maps. LOVE them. When Firewatch gave me a map and a compass, I got super excited. In order to go anywhere, you really need to navigate with the map and orient yourself with the compass. This is super tactile and it made the game feel even more real. If you get really adventurous, you can try setting out using just your landmarks and the compass, which actually might be possible as you continue through the game and get more familiar with the area. You can also find other maps that will allow you to copy their information over to your map, which can help with trail markers and landmarks. There are small details I loved, like Henry always tapping the overhang when he leaves his tower in the morning, and Henry getting out of breath when he’s climbing. His body feels like it’s there; it’s not just a vessel for you to play the game through. The fictional books you can find scattered throughout the world are a nice touch too – I wish they were real, especially the hard-boiled detective series! It took me five hours to complete, although I admit I didn’t explore as much as I might have been tempted to because of the draw of the plot. I plan on playing again to see what I might have missed! 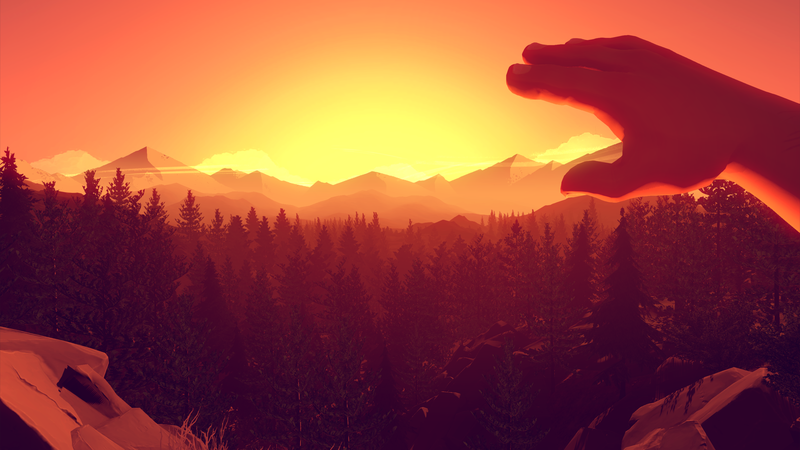 Firewatch is a stunning story-driven game that I thoroughly enjoyed. Everything here is top-notch, and it’s one of my favorite games so far this year (I know it’s early!). I loved savoring this game and taking in my surroundings. Also, there’s a late title card. I love late title cards. I can’t wait to see what Campo Santo will bring us in the future – this is a wonderful start. 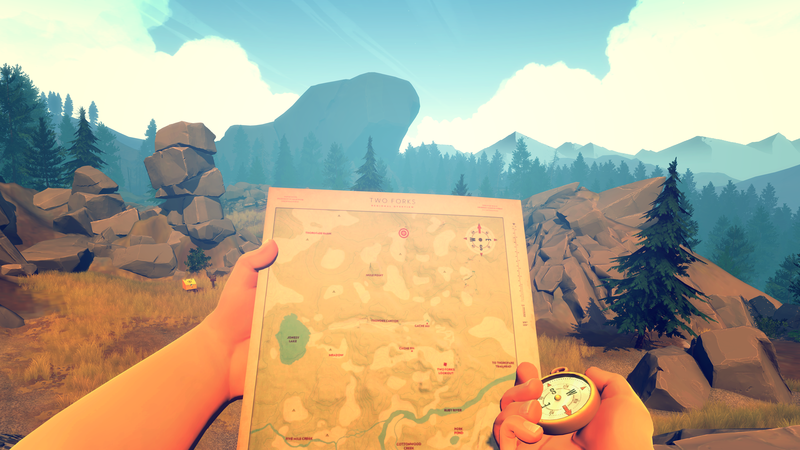 You can get Firewatch on Steam for Windows, Mac, and Linux $19.99. It’s also available on PlayStation 4 (plus members get a 10% discount until February 16). The Steam version has a feature that will allow you to visit your time in the game at an external site, where you can get your in-game camera developed. Follow the game on Facebook, Twitter, YouTube, Medium, and the official site.